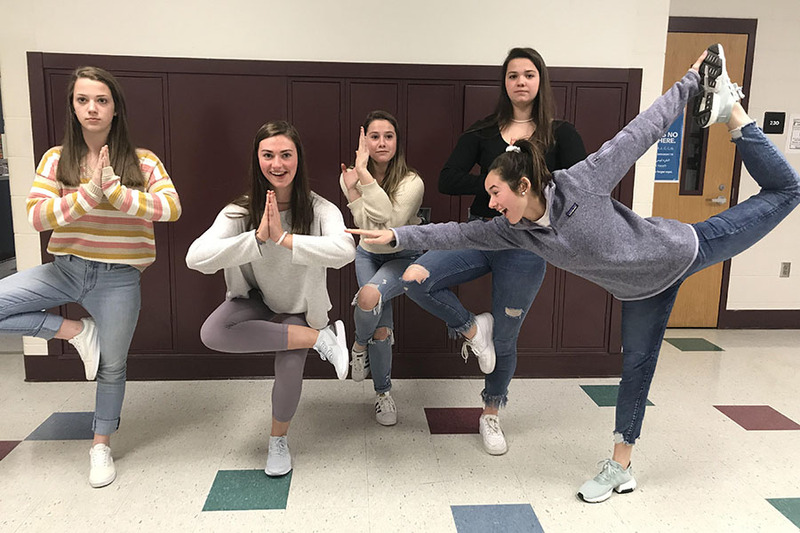 Peyton O’Connor, Jessica Hubert, Meredith Yardley, Tasha White, and Teresa DeMaio, all from the junior class, strike a pose in the halls. Yoga is an enjoyable activity to do with your friends. 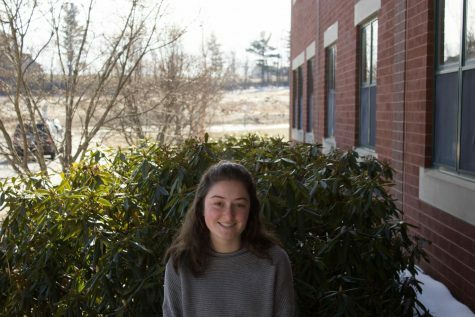 “Yoga is a way of life,” said O’Connor ‘20. Yoga has been around for many decades, but Bikram Yoga, also known as hot yoga, was introduced to Americans in the 1970s and has taken off ever since. Regular yoga has always been a form of stress-relief and meditation, but hot yoga offers more benefits that can’t be achieved through regular yoga. Bikram Yoga is just like regular yoga, except it takes place in a heated room with a very high temperature. There are studios all over the world, and now health clubs have also started to incorporate them into their memberships. But what has sparked this increasing popularity over the past few decades? Stephanie Powers helps to teach and run the new yoga studio at Choice Fitness in North Andover. “I quickly learned that yoga wasn’t so much the flexibility and strength…but it was the fact that [I] could care for others, and be cared for in a nurturing environment,” said Powers. For many people, hot yoga is a way to release stress after a long day or even just participate in for a relaxing activity. Hot yoga also allows a way for people to connect themselves to the world and their inner self. “Yoga helps you remove obstacles that keep you from being who you really are,” Powers said. In a study that was conducted in 2011 by The Washington Post, it was revealed that the majority of people felt as if a weight was lifted off their shoulders after participating in hot yoga for eight weeks consecutively. 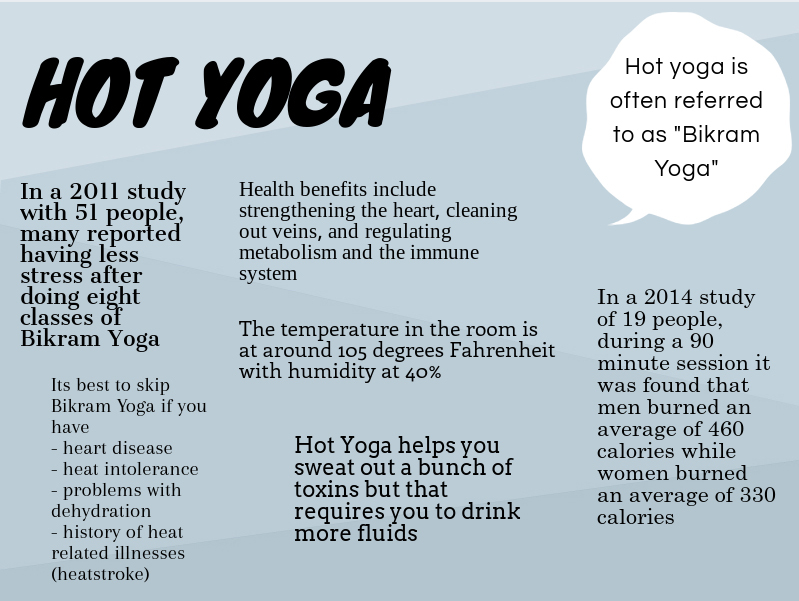 Many people participate in hot yoga to benefit their physical health. “Hot yoga [burns] more calories than regular yoga, and it provides the stage for a deeper stretch than regular yoga,” said Powers. According to VeryWellfit, the delivery of oxygen to parts of the body during hot yoga, like muscles and the brain, is larger and more varied compared to regular yoga. This allows flexibility to improve over time along with muscles capacity. Another nice thing about many hot yoga studios is that they offer different classes that cater to the different levels people may be at. For example, there are beginner classes and expert classes. This way, participants can choose which class will be best for them. Incorporating different stages of classes into studios benefits not only the people, but the business as well. Offering multiple classes opens up a wider variety of people who are able to partake in the activity. There are a few students at our school who have attended hot yoga, including juniors Tasha White ‘20 and Teresa DeMaio ‘20. “I’m a really stiff and uptight person, so going to [hot yoga] really relaxed me,” White explained. White started going to yoga when she got a month pass for $30 at a local yoga studio. DeMaio, with whom White went with, got the pass as well and stated that she hasn’t gone as much after the pass expired (since it’s an activity on the pricier side). However, after going to hot yoga classes, she explained that “you can just lay your mat out in your bedroom, listen to relaxing music…and do your own yoga…and get your own benefits.” This is an activity that is easy to bring to your home and requires minimal activity. Overall, she enjoyed the experience. 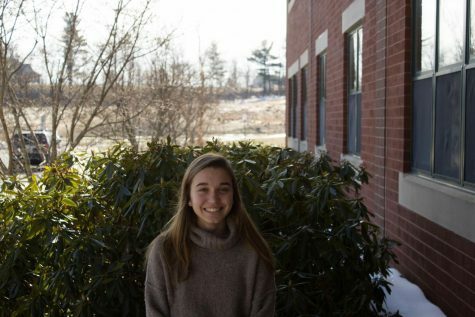 “It was one of the most relaxing things I’ve ever done in my life,” said DeMaio. Not only are there students that participate in hot yoga, but physical education teacher Tracy Gray does as well. Gray attends hot yoga two to three times a week and highly recommends it. Gray attends “to help [her] body feel better and recover,” but there are also other purposes for going; these simply just depend on the person. Either way, “it’s good for your brain and your body,” explained Gray. Brian Tracy, a professor from Colorado State University in Fort Collins, conducted a study with one of his graduate students as a partner. This was one of the first studies ever to be performed on the subject of hot yoga and was published in 2008. “The study randomly assigned 21 healthy young adults to attend three Bikram classes a week for eight weeks or to do whatever activities they normally do”. They concluded the results after two months. Tracy and his graduate student found that all 21 participants improved in at least two categories: flexibility and strength. In the end, hot yoga only benefits the participants that take it seriously. If at any time you are looking for a healthy way to relax or improve your body, hot yoga is a great activity for those purposes.